Let’s be serious here. This meal is not going to win any awards for looks. And it isn’t gourmet. In fact, you should just pass this by if you are looking for an elegant dinner for company. 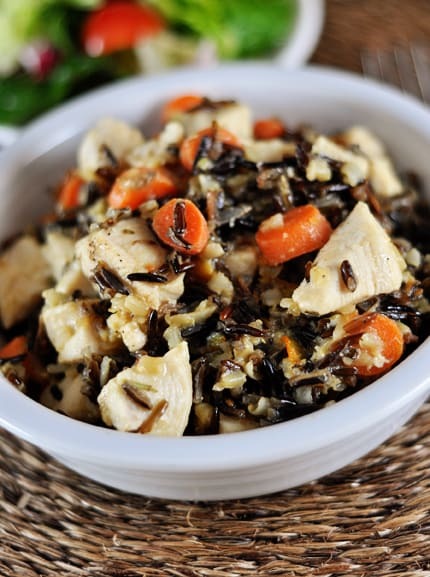 But if you want a down-home, filling, hearty and healthy meal that is packed with delicious flavor and is a snap (read: quick and easy) to prepare, then this rosemary chicken and wild rice fits the bill nicely. A unique pairing of flavors, sauteed chicken gets a boost from a smidgeon of orange marmalade and a bit of Dijon mustard. Rosemary adds the fragrant taste to the dish and the nutty wild rice compliments the other components beautifully. If you’ve never used orange marmalade, don’t be afraid! I hadn’t either before this dish and when I went to look for it in the grocery store (no, I wasn’t up to making my own – although I hear it’s pretty easy! ), I was surprised at the selection. I chose an all-natural brand that had very few ingredients: oranges, lemon, water and sugar, and was pleasantly surprised at the fresh, bright taste it added to this chicken dish. Simple and no-fuss, this meal is perfect for a busy weeknight! I served this with a simple green salad and slices of buttered whole wheat bread. In a medium pot, cook the wild rice according to package directions. If desired, sub the water for chicken broth and 1/2 teaspoon salt to give the rice a boost in flavor. While the rice is cooking, heat the oil in a large 12-inch nonstick skillet over medium heat. Add the garlic and saute, stirring constantly, until the garlic is golden and fragrant, 1-2 minutes. Add the chicken and carrots and saute, stirring frequently, 3-4 minutes. Stir in the rosemary and cook until the chicken is cooked through, 3-4 minutes longer. Stir in the marmalade, mustard and pepper. Cook, stirring frequently until heated through, about 3 minutes. Stir in the hot rice. Toss to combine. Serve immediately. Orange marmalade can usually be found near the jams/jellies. Look for a brand that is all-natural or low in sugar to let the real taste of the orange shine through in this dish. 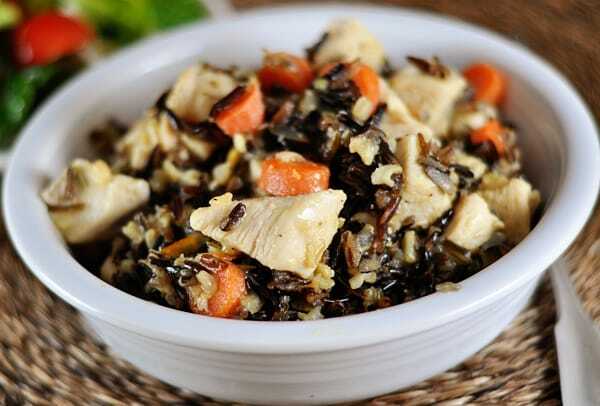 Also, plain wild rice can be a bit expensive or hard to find but I have easily found a wild rice/brown rice mix (I've found it at Walmart and several other large grocery chains) and that is what I used in this dish. Delicious! I did a little less marmalade and a little more mustard and it was perfect. Saw this recipe and just had to try it… rehydrated about a tablespoon of dried shallots and added them to the pan with the garlic; defrosted a pint size freezer bag of brown rice from my freezer stash and added it a few minutes before adding the orange marmalade, mustard, pepper and the 3/4 cup wild rice (cooked in chicken broth as you suggested). Thumbs up all around! Made this for a midday potluck, with boneless (free-range) chicken thighs and the brown/wild rice combo, with a couple spears of celery added, then refrigerated it overnight and reheated it slowly before the potluck. Used my own home-grown French culinary rosemary, chopped in a little coffee mill so it disappeared in the mix, but released its full flavor. Can’t wait to have the second dish for dinner tonight. Yum! I reduced the rosemary a bit, skipped the orange marmalade, and tossed in a bit of lemon juice…it was delicious! Thanks for the recipe! I made this last night with roasted asparagus for a quick dinner. It was super yummy! I buy a french brand of marmalade only because it is the only one I can find locally that does not have high fructose corn syrup. It tends to be more bitter than other popular brands but I thought the rosemary and bitter orange married nicely 🙂 My husband asked for less marmalade and more mustard next time but my three year old loved it so I think it was a success! I made this last night and I think the two tablespoons of rosemary completely overwhelmed the other flavors. I think we all would have liked it with less rosemary. This is a wonderful, easy, family-night dinner that will make foodies happy. I’ve made it a few times – actually making it as we speak! – and love how easily it comes together. I don’t change the recipe at all. I made this last night. So easy and surprisingly yummy. A really nice change of pace to add to the menu rotation. Agree, agree, love wild rice, and that marmalade/mustard combo does sound yummy. I, too, think I can smell and taste this delicious dish right now. Thiswassooooogood! Such a nice palate change! Thanks Mel! What a great combination of flavors! Lovely dish, Mel. Thanks for sharing! I love rosemary! This sounds fabulous. Made it for dinner tonight. Kids loved it, I loved it, definitely a keeper! Sometimes quick and easy is just what you need! Thanks! Yum! I love meals like this…it may not be the most photogenic, but your photos make it look VERY appetizing. I can’t wait to try this! I have all the stuff to make this at my house right now! We are going to try it tonight. I love your blog because it has everyday cooking recipes like this. This is my kind of meal. More like this is awesome. When you post meals with rice, I end up making them over and over. Thanks!!! I’m intrigued by the flavor pairing. Can’t wait to give it a try! This sounds extremely comforting. I actually have a few jars of orange marmalade in my pantry that I need to use. Love all of the flavors in here. the orange and Dijon flavors sound like a great accent to the chicken and rice….will definitely make this! This sounds and looks amazing! I can’t wait to give this recipe a try. Sound wonderful and I think I can even smell it. I love the idea of orange and Dijon mustard, interesting combo. Thanks for sharing. YUM! 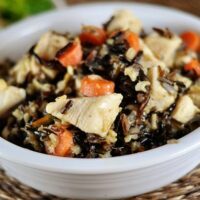 My family loves wild rice, and I’m sure the addition of orange marmalade makes this especially delicious!